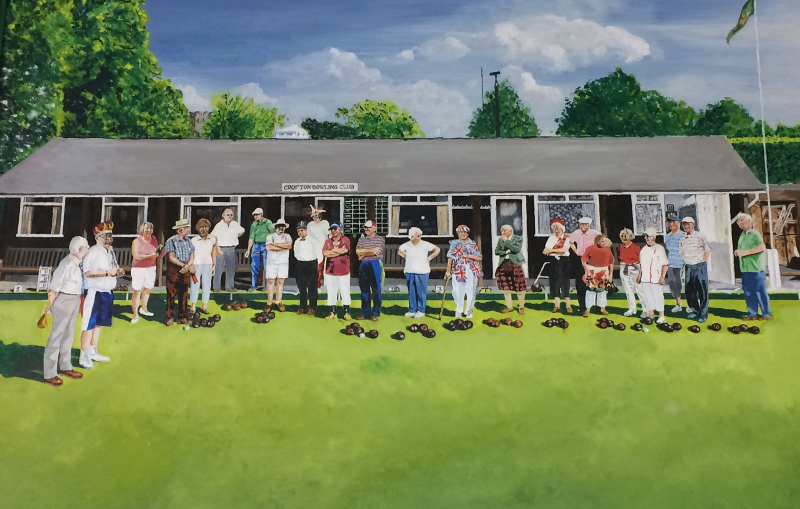 An image of a painting of our Club and some of our Members enjoying a Fun Day! Crofton Bowling Club was founded in 1980 and has around 100 members (ladies and men). We are a friendly 'mixed' club and have many social games and events all season. We are also licensed to sell alcohol. We have 'mixed' teams in the Gosport and Fareham League and men's and ladies' teams in the respective Portsmouth and District Bowling Associations' Leagues. Some of our players also represent the County. We very much enjoy hosting touring and visiting teams. We have two fully qualified coaches available for beginners aged 8 to 80 (or more). Our coaches can also assist people either returning to the game or those wishing to brush up on their bowls skills or iron out any 'kinks' in their game. More info here. The club is close to the centre of Stubbington village, between the Crofton Community Centre and the Tennis Courts. A map of our location, plus directions, is available here, with 'accessibility' information here. If you have any queries or would like further information please click here and send us a message.